The photographic research of Henning Rogge demonstrates that even 70 years after World War II, the traumas are not completely eliminated. With camera equipment, conductors and navigational equipment he roams the German province, wanders through forests, goes over fields and meadows. With the help of aerial photographs he identifies the places where bombs and grenades have driven funnels into the earth. In part hidden close to paths that cross the woods or on the fields that a depressed horizon keeps down, the holes have turned into silence and realities of solitude. The photograph itself is a soundless, motionless medium, it stresses the aura of times forgotten; recording, the past gives the inconspicuous place a different dignity. Henning Rogge’s approach is guided by formal, artistic rigour. Most frequently from a slightly elevated position, the lens approaches the crater, producing images of closeness and simultaneously preserving a distance. The viewer hovers over the imaginary place of the photographer and cannot move forward or backwards. […] Henning Rogge regards his photographs as landscapes. Indeed, one might consider his images within the tradition of an idealising iconography, a genre where one seeks to withdraw from the society of men. The habitats (biotopes) which have formed partly in the water-filled holes could be considered as modern Utopias of a better world, but ultimately point to the loss in a world where nature is at the disposition of mankind. The Eidyllion – meaning “little picture” in ancient Greek – is, in its illusory beauty, also a bearer of unrest. The hole of the crater also represents a hole in the reality of world history: The past is seen only as a residual effect that can hardly be met by the imagination. Very often, the smooth water surfaces resemble holes of which the impenetrable and black surface reflects not only the present but can also be compared to blind eyes that have seen the horror. 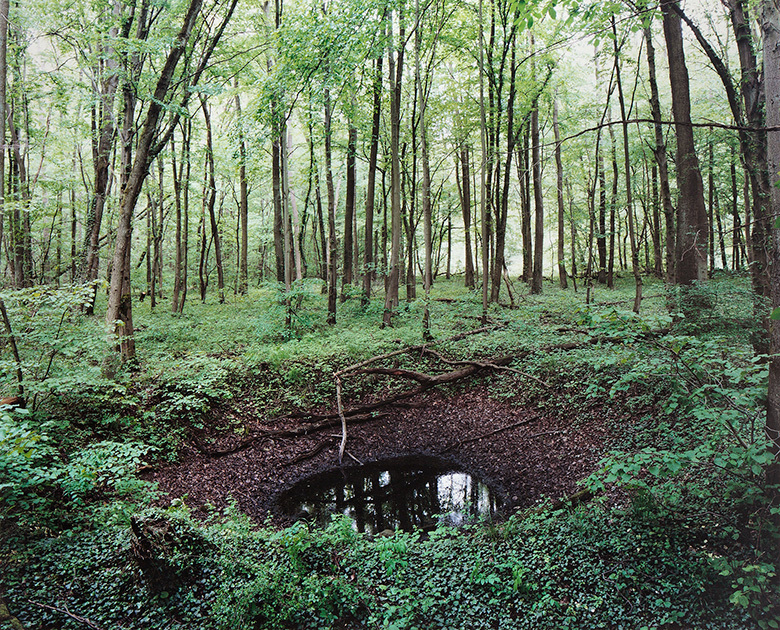 It is not the intention of the photographer to translate this abyss into pathos, but the real bomb crater should matter as much to the viewer than the visual impact of the photograph. There is a rift driven between the image and the narrative, the visible and the story behind, between the past and the present, between Utopia and a pessimistic anthropology that can receive its confirmation through the wars of the twentieth century.